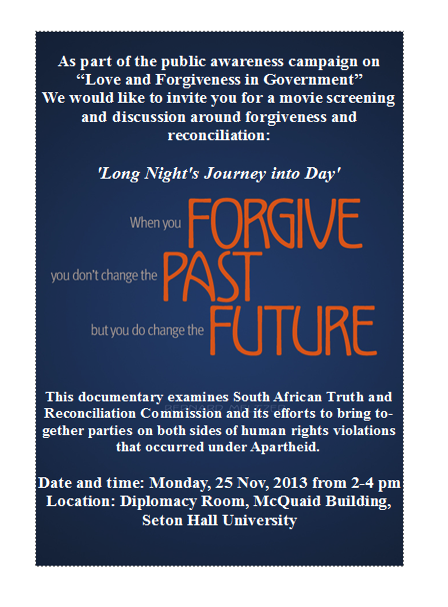 As part of the public awareness campaign, Love and Forgiveness in Governance Project team at Seton Hall University has organized a screening of When Enemies Turn To Brothers on Friday, April 11, 2014, 3-5 PM. The movie screening was followed by a lively discussion around the topic of forgiveness and reconciliation. The movie follows the stories of Bassam, a Palestinian and Rami, an Israeli, who both lost a daughter to the conflict. The film shares their personal journeys of finding forgiveness, their friendship, and their work to build peace in their communities. We invite the participants to share with us their thoughts and comment on the discussion and the movie. The story of Bassam and Rami is one of courage, faith, and resilience. Despite all they have been through and despite all the difficulties they face in building peace in their community, they continue to remember why they are willing to dedicate their lives to finding peace, love and forgiveness. Perhaps part of the solution to finding peace lies in an ability to accept that we will not understand everything in conflict. We may not understand all the roots to hatred and violence, but we must understand that peace cannot be found with hatred and violence. It must be found through love and forgiveness. Both Bassam and Rami are powerful examples of how to find love and forgiveness regardless of the circumstances we are in. This movie is a great tool in teaching how to forgive. During the movie I could not help but wonder what was going through the men’s heads. The amount of character one must have to be able to not only forgive, but to teach forgiveness is amazing. I think we all could learn from these two gentleman. If they can forgive those who killed their daughters, surely we can forgive the minor things in life. This is the type of positive propaganda that should be showed in places of conflict and places where conflict is possible. The world should realize that killing for retribution is not the answer. I was really touched by the movie Within the Eye of the Storm and the lives of Rami and Bassam. I felt that both men exhibited a willingness to understand the context of the conflict between their communities, which then opened them up to understand one another. This understanding has led each of them to support reconciliation within their communities. In the film you see their passion and openness broaden the minds of others, but you also see them struggle against the ingrained attitudes of their communities. They exhibit love and forgiveness both by accepting one another deeply, as well as sharing their perspectives with friends, family, and the community at large.